IN THE third worker-related incident in the past fortnight, the police were called in yesterday when a dispute between a Chinese worker and a sub-contracting company threatened to escalate into a sit-in. A female supervisor at the sub-contracting company told The Straits Times that the construction worker arrived at the Thomson Road condominium worksite yesterday morning and refused to leave unless the police were called. After failing to convince him to leave the worksite, she called the police because she had no other choice, she said. The worker, who arrived here a few months ago, had scuffled with his foreman on Thursday. According to the supervisor, he was told he would be transferred to another worksite but was unhappy with the decision. "It's just a small issue. This kind of thing has never happened before in this company. Now workers think that if they blow something out of proportion, they can get what they want," said the woman, who declined to give her name or identify her company. 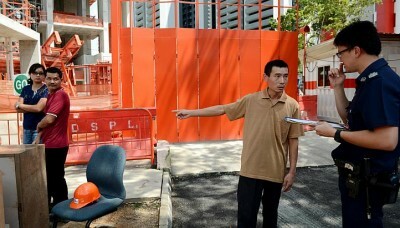 The Straits Times was unable to speak to the worker or the foreman, both of whom were being interviewed by police. The incident happened a day after two mainland Chinese construction workers climbed a 10-storey tower crane in Jurong in a protest over wages. Last week, 171 SMRT bus drivers from China also staged the first labour strike here in 26 years. In response to yesterday's incident, a Ministry of Manpower representative arrived at the worksite at 2pm, and left shortly after. A police spokesman said they received a call at about 11.20am, requesting assistance at a construction site near the junction of Balestier Road and Thomson Road. "Upon police arrival, it was established that a dispute between two parties had occurred. Both parties acknowledged police advice to settle the dispute amicably and no further assistance was required," said the spokesman.